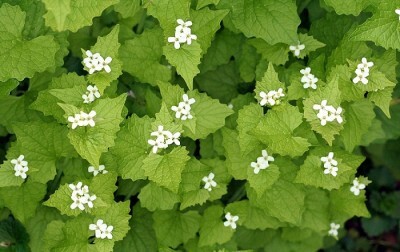 Garlic mustard is classified as an invasive weed, and teams of volunteers yank it out of their local parks every year. But only the smart ones eat it. 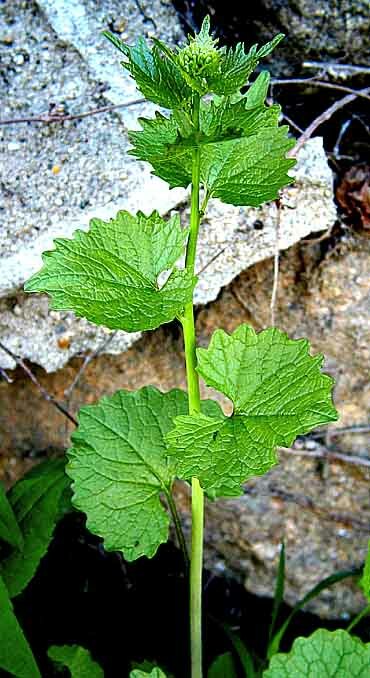 Garlic mustard is extremely high in fiber, beta-carotene, vitamin C, zinc and vitamin E. In addition, garlic mustard beats spinach, collards, turnips, kale, broccoli and domesticated mustard for all nutrients and is high in omega-3 fatty acids, manganese and iron. It has a distinct garlic flavor. Edible parts: Leaves, seeds, flowers, roots, and stalks of 2nd year plants before flowering. Harvesting: Leaves in any season can be eaten but once the weather gets hot, the leaves will taste bitter. Larger plants have good sized whitish taproots, which taste like horseradish, which are good from late fall to early spring, before the flower stalks appear. Preparation: Can eat raw in salads, mixed with mild greens. Or steamed, simmered, or blanched and sauteed. Cook no longer than five minutes, or the leaves will become mushy. Try making garlic pesto! Identifying: First year growth and new spring leaves are basal and have a somewhat scalloped edge. 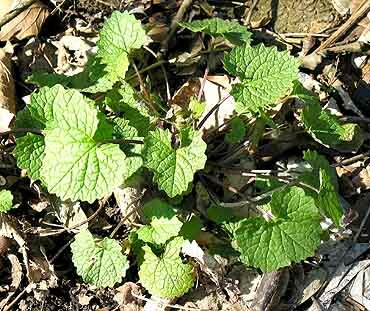 Once the stalk grows, the leaves become smaller, triangular in shape and you know for sure it is garlic mustard when you detect the scent of garlic when crushing a leaf. There aren't any poisonous look alikes. they are invasive like the lemon balm. I would eat them too! I havent seen this one around yet.